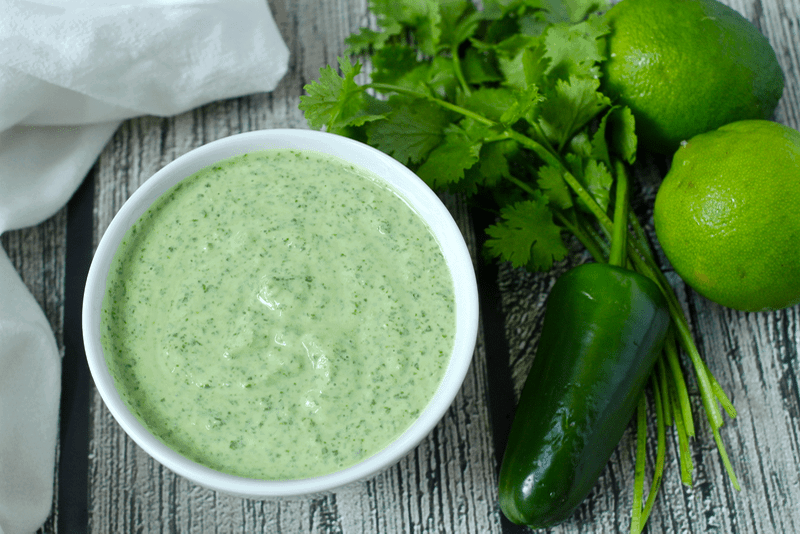 This creamy cilantro lime dressing takes just minutes to make in a blender and has a bright, fresh taste that’s great for salads, grain bowls, and grilled chicken and meat. Homemade salad dressings may sound a bit intimidating. I mean, compared with buying a bottle in the store, it seems like quite a lot of work. And maybe sometimes it is. But I opt for the ridiculously easy types of dressings and I don’t think I could go back to store bought. It’s just worlds better when it’s homemade! 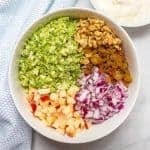 This creamy cilantro lime dressing just requires you throw all of the ingredients into a blender (or you can use an immersion/hand blender) and turn the sucker on. 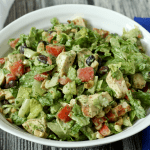 Dump and blend and you get a fabulous, creamy, homemade dressing that you will want to drizzle on ALL the foods! 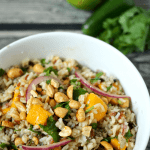 I love this dressing paired with my southwestern orzo salad and my southwestern chopped salad. It stands up well to those big, bold flavors! I use plain (non-fat) Greek yogurt here to bring a bit of tang to the dressing, and to make it more a little more healthy. 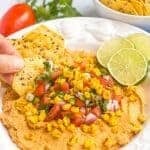 You could substitute sour cream if you prefer. You can control the amount of heat in this dressing. If you remove most of the seeds and membranes from the jalapeno pepper, it won’t be spicy at all. Or leave some in if you want a bit of a kick. You could also add a few dashes of hot sauce to spice it up! You’ll need one good size, juicy lime for this. If yours are small, it might take two to get enough juice. You can store this dressing, in a covered container, in the fridge for 3-5 days. Blend up a batch today and see how easy homemade dressings can be! And my simple spinach salad includes a recipe for an easy balsamic vinaigrette. And here’s my new VIDEO to show you how easy this recipe is to make! 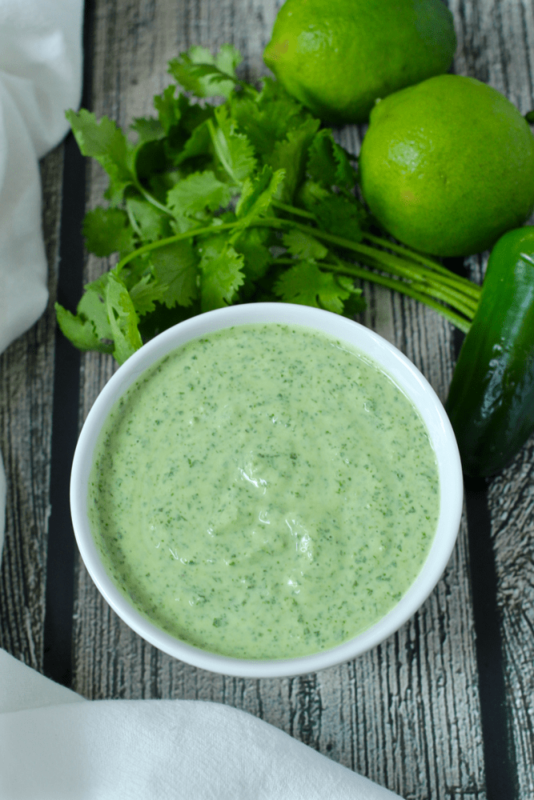 A bright, fresh, creamy - and super easy - homemade cilantro-lime dressing! Combine all ingredients in a blender or immersion blend. Blend until smooth. Done! I use plain (non-fat) Greek yogurt but you could substitute sour cream if you prefer. You can control the amount of heat in this dressing. If you remove most of the seeds and membranes from the jalapeno pepper, it won't be spicy at all. Or leave some in if you want a bit of a kick. 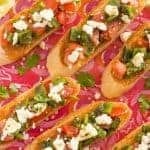 You could also add a few dashes of hot sauce to spice it up! You'll need one good size, juicy lime for this. If yours are small, it might take two to get enough juice. This sounds (and looks!) so good, and I love that it’s made with Greek yogurt! Thanks, Sam! I love that it’s so creamy but still nice and light – perfect for a healthy summer salad! It sounds dreamy indeed! 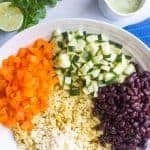 Cilantro and lime is such a refreshing combination and I think it works great on most salads. I love making my own dressing, I’ll give this a try next time I make a salad. Thanks, Petro! 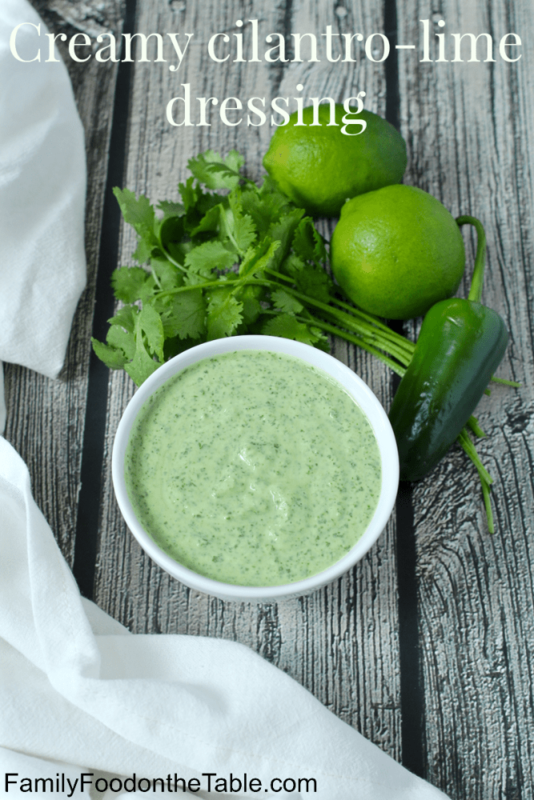 Cilantro and lime do go together so well, don’t they? On so many different foods, too. Hope you’ll let me know how you like it. Have a great week! My kind of dressing! This looks delicious! I prefer to make my own too – it’s so great to be able to control the ingredients! This sounds so perfect! Also, I love the color, it is so pretty!